No more salty shoes. No more blowing snow. No more frozen earth. The days are longer and nights shorter. The air is warm and humid. The winds of change have arrived. And with these winds come all the residents of this land. I spent quite some time in the woods during March and April, photographing and studying as much as I could. I came across some astounding life I had always wanted to see, but this is just the fraction of it. I was able to photograph most that I saw through my eyes, but capturing the subtle scent of spring is impossible. The monochrome browns are disappearing as tender greens dot the trees. Some plants are already blooming, much ahead in the race of regeneration this summer. Medway Creek, just another tiny paradise lost amidst urbanization is showing off its phenomenal display in the undergrowth as well as treetops. From moths and butterflies, flies and beetles, from birds and mammals and from fishes to snakes, every organism has become active. It is like metamorphosis, where after four long months of pupation, life ecloses. This transformation is not only true for the lepidopterans that are now out and waiting for the flowers to bloom, but for beetles and gnats too. As plants start to bloom, there is a sudden boon in insect diversity as well. In case of butterflies, the very first one to be seen is the Mourning Cloak butterfly. It is well known for hibernating throughout winter, and is the first to be seen basking in sun or flying high in the canopy. If you look closer at the tiny fauna, the commonest to be seen are the midges. These very many flies that have emerged from their gall-homes are pretty common to be missed. These mosquito look-alikes are pretty abundant in wild as well as urban areas. It is not uncommon to see a few dead in homes. Since the adults have a short lifespan, their only purpose is to mate and carry on the progeny, hence it is not surprising to see mating adults so early in spring. Midges and Gnats are true flies. It is a name commonly used for several fly families in the suborder Nematocera. There are Gall Midges and Net Winged Midges, etc. that are not so annoying as Black flies, eye gnat, sandflies and their relatives – mosquitoes and midges. I am not sure which gnats these are, but they could probably be Gall midge. The larvae of Gall midges feed on plant matter and cause a variety of galls, such as the Goldenrod galls I talked about on the previous spring post. The midges, although some are a menace, are also pollinators and hence valuable to the ecosystem. As days go by, it is not surprising to see flies everywhere – houseflies and bottleflies are the most common to be seen on a nature walk. Warming temperatures wake every little and large organism; one of the little fellows I met on a forest path was a millipede. It hurried down a boulder standing amidst an ocean of decaying leaves – something that shelters these organisms such as millipedes, other insects and spiders. It also provides the warmth for micro-fauna to flourish, and most important of all, nourishment for these forests. This millipede was probably basking in the afternoon sun when I found it on the boulder. Identifying it is beyond my capability, but it’s worth mentioning that the largest millipede of North America, Narceus americanus is seen here in southeastern Canada. Ants are back in action. One of my favorite subjects to watch, I found this pair on the outside of the window on a sunny morning. Worst thing is, the window was sealed hence I couldn’t get a better shot! The Prenolepis sp. (impairs? ), commonly called Small Honey Ant or False Honey Ant and also Winter Ant, are the very first ones to see just as temperatures begin to rise again. I wrote on the first ant I saw late in winter, which probably is a Prenolepis queen. The Queens and Drones of these ants born in fall season and quickly undergo hibernation for winter. As soon as winter passes, they start to emerge – by late February and March. Formica sp. 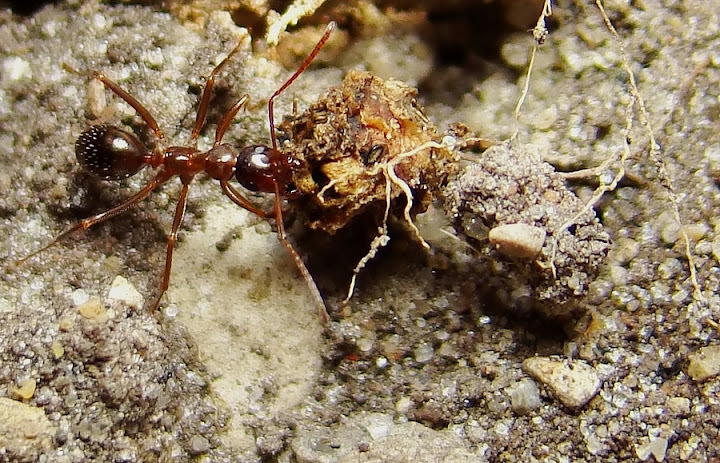 inspecting a crushed ant! I also came across many Formica sp. (fusca?) of ants. These ants were seen on an open grassy patch, with a few boulders around. After photographing them, which was a difficult job since the sun was too harsh, the rock was too bright and the ant was dark, hence exposing them well proved pretty tough. I photographed them in the afternoon and returned in the evening when the sunlight was soft enough. Only after watching the pictures on the monitor did I realize why the ants were scurrying on that specific rock. I saw a crushed worker, and the other fellow worker ants were inspecting it. Interesting, since we might think ants don’t give a damn who dies. Actually, they do, but there is a difference. The ants were around in greater numbers, some of them around the dead ant. This is probably because of the release of chemical signals from the dead ant to alert her nest mates. From the behavior of the ants, they seemed alert and hasty, often stopping abruptly, raising their upper body and opening their little big jaws. I have no idea who killed their mate, but I’m sure they were very, very angry. Another nest mate inspecting the crushed ant. Another ant species was seen further upstream. There were some workers scavenging and scouting on the forest path. I am still awaiting their identification since I have no clue what these ants are. Miner Bee - Andrena sp. When I was photographing the Formica sp. 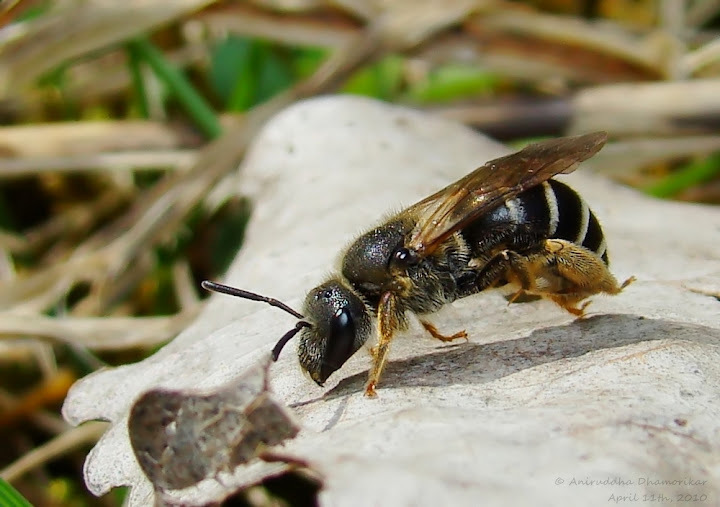 of ants, I saw this Miner Bee – Andrena sp. They are small bees that burrow in the ground – often creating multiple tunnels, hence the name. This little bee sat on a dead leaf and cleaned itself. It’s good to see this important pollinator around as more and more flowers bloom. Syrphid flies are very common all around the creek. These bee-mimics prefer to sit closer to the ground. This one is a Helophilus sp. I observed them chasing other Syrphid flies, often taking a break to bask in the sun and groom. The Three-spotted Tiger Beetle, Cicindela sexguttata, is the most common Tiger beetle seen here. These are my most favorite of all beetles. Several fellows were seen on the forest path. They are easily identified by their iridescent blue/green exoskeleton, and peculiar three (sometimes two or none) spots on the elytra. They prefer open patches, as such; they will prefer a forest path clear of leaves over a forest floor. This helps them run around chasing their prey. Now they are beetles, but as good as a tiger. These beetles are called-so because of their ambush hunting tactics. They will sit, hide, stalk and run behind a prey. In fact they are more efficient than tigers because they can fly. The one I photographed was walking around the forest path looking for prey and took breaks to bask on the rocks. On some nature walks, I could not photograph any birds. Firstly, the time was not always right – I used to go out in afternoon, when the sun is high in the sky. Secondly, afternoon is not really a good time to find birds, it’s either during dawn or dusk that the chances of seeing more birds is better. Lastly, I was beginning to get tired of changing the teleconverter for every macro photograph. So as I was changing the teleconverter, I happened upon this moth caterpillar that was feeding on grass. This is a larva of Ctenucha virginica, a moth belonging to Arctiidae. It is an endemic to eastern North America. Water skate were one of the first few insects I saw as soon as spring thaw came to an end and stagnant pools were formed. It is a true bug, in the family Gerridae and “walks” on the water with the help of surface-tension. They are predatory, and prefer still waters. I was not surprised to see Wolf Spiders (Lycosidae) so common all around the creek. These were one of the most abundant invertebrates seen. They are very quick, wary and pretty small, hence photographing them is a challenge but fun. My lucky finding was a Red Velvet Mite. These belong to Trombidiidae family in Class Arachnida. They are seen in soil litter. They are active predators as adults but early instars are often parasites on other insects, arachnids and reptiles. I already wrote about the Eastern Garter Snakes earlier in the month. I am yet to produce the tiny documentary I mentioned that I will be posting later in May. 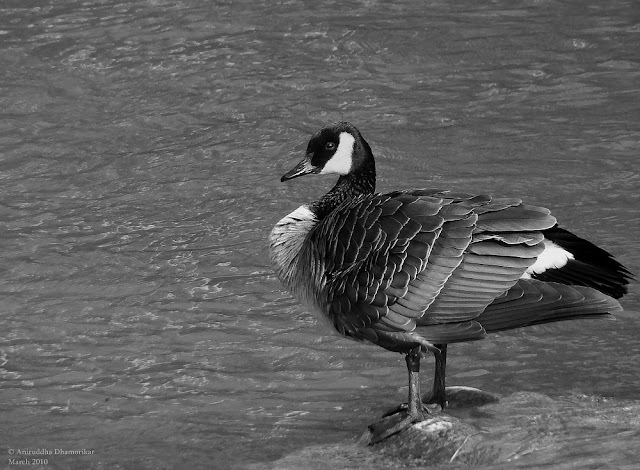 There is not too much to discuss about Canada goose, except the fact that they are pretty habituated to humans, although they are completely wild. This makes them an excellent subject to practice photography and composition. There are several pairs across Medway Creek; all of them give a decent opportunity to photograph as landscapes change. Since they have a strong contrasting coloration, they are all the more better subjects to learn exposure and different compositions such as the black-and-white photograph I took several weeks ago. Besides Canada goose, Mallard Ducks are fairly common, too but are very wary and either swim faster or fly away on approach. A lonely Mourning Dove was seen on one windy evening. These birds are extremely wary here in the woods, but I was surprised to see two visit my balcony one day. They either sit high in the treetops, or come down on the forest floor to peck on seeds and insects. Seeing them is always certain, a group of few always occupy a sycamore tree across the creek. They are not uncommon in urban and suburban areas either, and are rather more tolerant to human presence than here. It is interesting to see such behavior in the birds that are considered “domestic”, simply because they are so common in urbanized areas, yet living a “wild and wary” life in the woods. I wonder how this behavior affects the traits in the offspring of the two populations in different environments, and can urbanization lead to evolution/ devolution in such birds? It’s literally raining Northern Cardinals here. I used to see one or two males around during winter, but now I have stopped counting them. They are the most abundant birds next to Black-capped Chickadees. I saw the first female who sat too close to me, but obscured by dense thickets. Although plentiful, photographing them in the open is very difficult since they are very shy, and will often hide in thickets at slight disturbance. 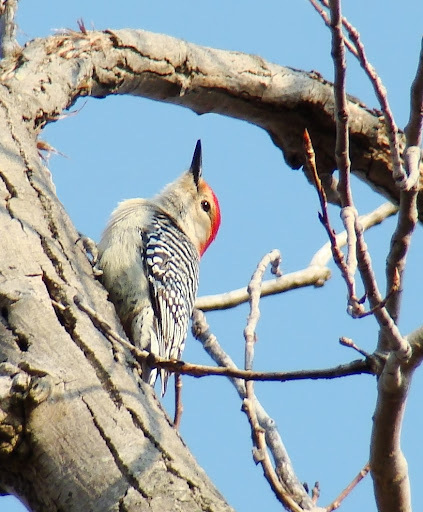 A pair of Red bellied woodpeckers came and settled on a bare tree. The male chased the female (?) or another male (?) and perched high on the tree, calling on top of its voice. This was the first time ever I saw this woodpecker. They usually habit deciduous forests, hence seeing them is not uncommon, but I have only seen them once over two months. A Blue Jay pair is currently nesting here. The months of March, April and June is the breeding season, and this pair is busy in one part of the creek, which could be their territory. They are often seen together, feeding and flying silently in the branches. Seeing them in an open area is pretty tough, since they are very wary and prefer thickly wooded parts of the forest. Now these birds are considered intelligent and brave. They are known to chase away birds of prey, as well as give alarm calls that alerts other birds, a great example of altruism, where an unrelated species helps (unknowingly, mostly) another (un)related species of approaching danger. This is a pretty interesting behavior, considering there are many birds of prey around such as Red-tailed Hawk and Cooper’s hawk that are known to feed on Blue Jay and other birds. Brown headed cowbirds were seen perched high on a tree close to where the Blue Jays were seen. There was a small noisy flock of males and females, perched high on a bare tree. According to Allaboutbirds.org, “[Females] forgo building nests and instead put all their energy into producing eggs, sometimes more than three dozen a summer…they lay in the nests of other birds, abandoning their young to foster parents, usually at the expense of at least some of the host’s own chicks.” I also came across one Common Grackle on a casual walk. 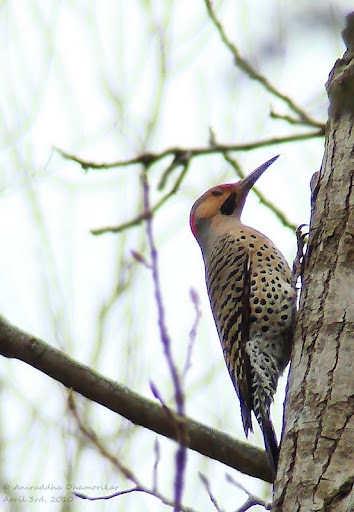 On one of the trail, and often thence, I also came across a Yellow shafted flicker, later I saw another one, and I believe there’s a pair. It was also one of the birds on my wishlist. Wikipedia quotes Audubon guide, “…only woodpeckers that frequently feed on the ground…although they eat fruits, berries, seeds and nuts, their primary food is insects. Ants alone can make up 45% of their diet. They have a behavior called anting, during which they use the acid from the ants to assist in preening, as it is useful in keeping them free of parasites.” I came across this bird on a windy evening. A spring storm was on its way, but I was glad to have seen this bird just before it started to rain. Being in a forest amidst an approaching storm is an amazing experience, when a part of the sky is bright and blue, and a dark cloud hangs on the other half. The trees start to dance and sing in a choir, summoning rain and sending all the creatures of the woods in hiding. And just then, I happened to see a Woodchuck go up the steps across the creek, as soon as it saw me. It then, however, decided to come back and feed onto something, but it was hidden from the trees and I couldn’t manage a decent photograph. Woodchucks, or Ground Hogs, are known as the harbingers of spring. As Wikipedia quotes, “According to folklore, if it is cloudy when a groundhog emerges from its burrow on this day, it will leave the burrow, signifying that winter will soon end. If on the other hand, it is sunny, the groundhog will supposedly retreat into its burrow and winter will continue for six more weeks.” I wasn’t lucky to observe this interesting behavior, but I did happen to see another fellow on the campus. I came across an old journal article, where the author enlists the mammals of Wellington and Waterloo counties of Ontario. According to the author, Woodchuck is common throughout the region and numerous enough in some localities to be a menace to agriculture. He says, “Some litters of young are probably born as early as late March or early April.” I wish I came across the juveniles, but seeing two of them in a week was a good sighting. I also saw a Muskrat along the creek, munching on something. Another rodent was an unidentified Vole that vanished into the leaf litter in a split second. I do not have to mention Eastern Gray Squirrels, but the melanistic forms are now much lighter than they were before winter. This is perhaps because they are shedding the dark fur, since it is not needed in spring and coming summer. This is also one explanation why I saw more melanistic ones than the gray colored ones. Bloodroot was the first flower-of-the-season I saw. It was still budding when I took this photograph, and since then I have been observing them. It was photographed three weeks ago; today all the flowers are shed and the seeds are already ripening. 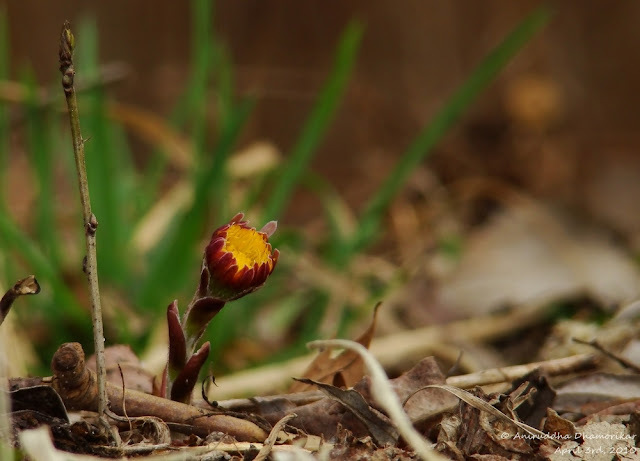 This short lifespan is what makes spring so special. It is commonly called Bloodroot since the root has a red pigment that comes out when the root is crushed. Clotsfoot is a perennial herbaceous plant, medicinally used as a cough suppressant. However, the discovery of pyrrolizidine alkaloids in the plant has resulted in liver health concerns, according to Wikipedia. The flowers also appear early in spring and vanish pretty quickly, and the leaves arise later in the season.